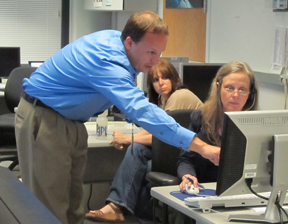 As the Pluto encounter simulation winds down on May 30, (from left) New Horizons Guidance and Control System Lead Gabe Rogers reviews data with Mission Operations Planner Sarah Hamilton and Mission Operations Manager Alice Bowman in the Mission Operations Center at the Johns Hopkins Applied Physics Laboratory, Laurel, Md. The science instruments aboard NASA’s New Horizons spacecraft were running at full tilt, with cameras snapping images, sensors scanning the space environment and the communications system trading radio signals with ground stations on Earth. No matter that the target of this activity – the Pluto system – was still about three years and 850 million miles away. On May 29-30, New Horizons “thought” it was July 14, 2015, and carried out the most intense segment of its Pluto flyby as part of the mission’s first onboard encounter simulation. The simulation was conducted at a distance of 23 astronomical units from the Sun – 23 times the distance between Earth and the Sun. When the real encounter happens in 2015, Pluto will be 33 AU from the Sun. The New Horizons team has been “scripting” the Pluto flyby for the past several years, building on the experience and success of the spacecraft’s 2007 flight through the Jupiter system. This week marked the first real test of that code on the spacecraft, in an environment New Horizons operators can’t fully duplicate on their computers. Last week, mission operators at the Johns Hopkins Applied Physics Laboratory in Maryland transmitted the 9,675 commands into New Horizons’ computers that guide all activities for the very day the spacecraft is closest to Pluto and its moons – about 22 hours of activity in all. The simulation started with a system-health check-in through NASA's Deep Space Network; New Horizons then turned from Earth and toward the spot where it was programmed to find Pluto. A few hours later the spacecraft turned back to Earth, sent a quick burst of housekeeping data to let operators know it was OK, then returned to the encounter. All told, the script called for 77 separate observations, with as many as four science instruments observing at the same time. The simulation ended just before 2 p.m. EDT on May 30. With the instruments aiming at empty space where Pluto and its various moons will be on July 14, 2015, the data New Horizons sends back over the next few weeks might have little science value – but from it the team will know whether the sequences went off as planned and the spacecraft pointed in the right directions. “From what we’ve already seen, we have a good idea that the spacecraft did what it was supposed to do,” Bowman says. “This first mission sim both retired a lot of risks by showing the actual spacecraft can handle the pace of activity we plan at Pluto, and it prepared the way for a more extensive, nine-day Pluto encounter sim next year,” says New Horizons Principal Investigator Alan Stern, of the Southwest Research Institute. New Horizons is about midway through its annual systems and instrument payload checkout, having been roused from hibernation on April 30. It’s currently humming through space at more than 34,000 miles (nearly 55,000 kilometers) per hour, between the orbits of Uranus and Neptune, about 2 billion miles (3.3 billion kilometers) from Earth. The team will ease New Horizons back into electronic slumber in early July.